Antwerp City Brewery’s De Koninck manufacturing site recently received a muster of Primacoustic Broadway panels as part of a significant renovation to open the facility to tours. 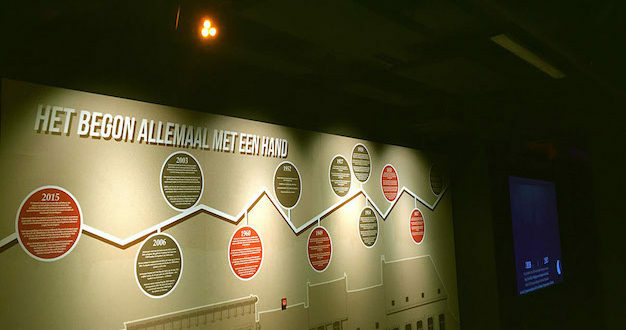 In late 2015 the brewery, one of Antwerp’s most important points of interest, opened an experience room to tell the story of their famous Belgian beers, including its famous “Bolleke” beer. The aim was to transform some of the rooms to accommodate visitors, ensuring guests could actually ‘hear about the beer’. The museum consists of various rooms with different shapes, equipment and furnishings. Primacoustic Broadway panels were selected for the project due to their variety of dimensions and the fact that they are suitable for use on walls and ceilings. The aesthetics of the space benefitted from the use of the same style of panels installed in all rooms. Steven Kemland, product division manager for FACE (Foundation for Audio-visual Commerce & Engineering), said: "To optimise the rooms, they were looking for better acoustics without ruining the beautiful architecture. When going through a museum, you want the sound to be clear and without noise for the next part of the story. Because the museum is situated in an old building and the acoustics were not yet optimised, it was very difficult to listen to particular parts of the story on the tour. Brewery De Koninck wanted to create an excellent experience for their visitors and we went in to present an ideal solution." "While observing the different rooms, it was clear they needed an advanced set of acoustic panels for a superior sound. The panels of Primacoustic are especially made for rooms where excellent acoustic sound is needed. The panels are available in different colours so that made it possible to choose a colour that blended perfectly with the walls and ceilings." "We are very pleased with the panels. Taking the tour and telling people about our beloved beers is now a pleasant experience,” concluded Anik Van Bellegem of Antwerp City Brewery.